PNP germanium diffusion alloy transistor intended as AM broadcast mixer / oscillator. Also made by Philips, Siemens and related manufacturing plants. Pure tin is bad stuff to have around. Especially too much of it. It's well known that the AF117 is particularly known to fail with time. This is invaribly due to Tin Whisker growth. Svätoboj Longauer (Kosice, Slovakia) wrote and asked if the Radio Musueum had any faulty AF117 that he might examine as he is researching Tin/Aluminium Alloys and thought it might be interesting. I replied that the "Radio museum" doesn't really have anything, but I happened to have some. I had already opened one and could confirm the failure was tin whiskers. whiskers. So, first result is very nice. I will continue. He sent me some nice photos. Electron Microscope at x 240 magnification after washing off the Silicone grease goo. Good ex-Military NOS (New Old Stock) Russian transistors are cheap. The whiskers will grow again. You can't know what damage the "cure" does to Germanium even if it tests OK after. I just replace them if they are reading low resistance on B, C or E to case or Screen). Screen wire ought to be connected to case. Perhaps on some batches of AF117 the tin plate on inside was too pure and too thick? 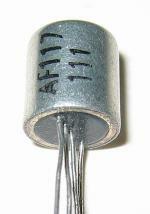 In any case not all AF117 fail and failures of earlier transistors and later AF127 seem rarer. Perhaps the goo helps growth too. The Russian Germanium part I purchased to replace AF117 has no goo inside. Though RoHS generally bans Tin/Lead solder it's still allowed on non-domestic PCBs such as Military as it's more reliable. As well as whisker growth the tin joints can be more fragile or a bad join from the start. If the lead pitch is very fine then Tin/Lead solder is allowed on domestic items such as a watch as otherwise whisker growth is a problem. "Tin Plague" is caused by Gold connector or plating used near tin or on tin plated connector. (Tin in this case usually Tin/Lead). Nickel on Brass is OK.
Tiinned to Tinned is good (if Tin/Lead alloy) as the plug/socket if undisturbed becomes gas tight as the tin alloy gradually reflows. Silver on Brass, Copper or Steel wire/plugs is OK.
Gold plated connectors are a disaster. Domestic ones the Gold is too thin. Also Plug and Socket need to be both same Gold. The Gold will cause corrosion on non-Gold socket, probably electrochemical action. Also Gold PCB track plating bad at RF as usually there is barrier Nickel or other ferromagnetic layer plated to copper to take the gold plate, this then causes high RF losses. Outdoor Satellite LNB sockets are usually Aluminium alloy cast with case (probably then threaded). The cable plugs are usually Stainless steel. You know what Stainless does to Aluminium Alloy. More about Whiskers may be found on NASA Tin Whisker (and Other Metal Whisker) Homepage.